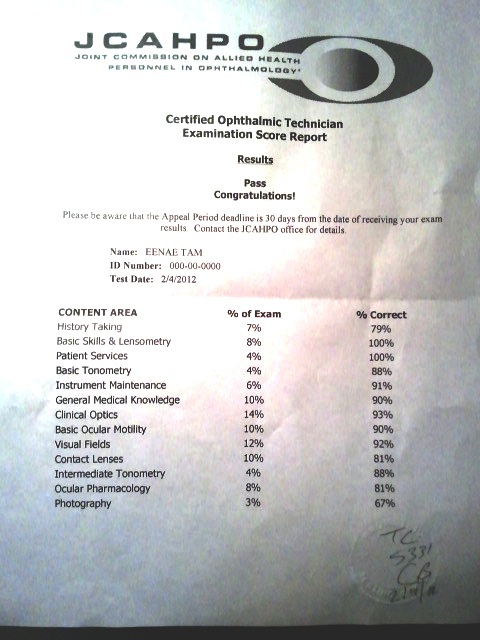 I took JCAHPO‘s Certified Ophthalmic Technician license exam in January 2012 and passed the written portion! It wasn’t easy but I managed to do it. If you are not quite sure how to START studying I would like to provide a study technique that worked for me and share it with you if you are about to or are planning to take the exam. I was in a bit of a rut myself, and boy did I really procrastinate (who can concentrate on studying during the holidays, seriously? ), but I knew the day to take the exam would come quickly so I had to plan appropriately. The Certified Ophthalmic Technician license is the second of three levels of licensing. The first being a Certified Ophthalmic Assistant and the third a Certified Ophthalmic Medical Technician. For more information on each, please click here. These are the study materials I used to prepare: Certified Ophthalmic Technician Exam Review Manual (The Basic Bookshelf for Eyecare Professionals) by Janice K. Ledford, The Ophthalmic Assistant: A Text for Allied and Associated Ophthalmic Personnel, 8e by Harold A. Stein and Raymond M. Stein, COT Flashcards, and handouts received at my local COT review course. During the 1st week I did the questions in the COT Exam Review Manual. Each chapter covers a good portion of each required subject of the exam. Some of the chapters are more than 200 questions which took me about 2.5 to 3 hours. If you do not have that much spare time or have children that refuse to go to bed, do 50 questions or an hour’s worth of questions a night. Just give yourself longer to prepare if your study chunks are smaller. You get the idea. I approached each chapter as if I were taking the exam. I did not look up the answers in the back of the book. I wrote down each question and wrote out my answer in a notebook. I tried to do a chapter a night, but that didn’t always happen. My goal was to finish all the questions of the book by the weekend, Sunday at the latest. At the end of each chapter I graded myself…honestly. The initial percentage you get is a good idea of where your weaknesses are and where you should focus your studying. 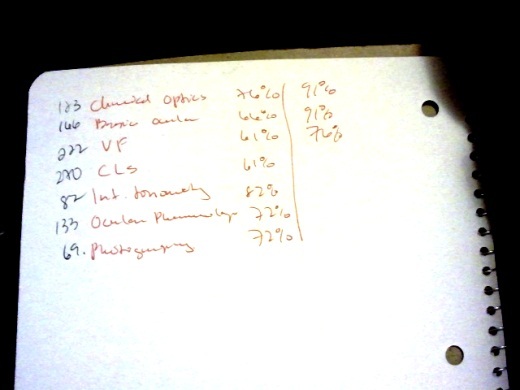 These were my initial grades: Optics 76%; Basic Ocular 66%; Visual Fields 61%; Contact Lenses 61%; Intermediate Tonometry 82% (that was a surprise); Ocular Pharmacology 72%; and Photography 72% (don’t get hung up on this, it’s only 4% of the exam). So Visual Fields and Contact Lenses were my greatest weakness. And according to JCAHPO two of the bigger areas that they would test on, 14% each at the time of this writing. Once the questions were completed and I knew where my weak spots were that gave me three weeks to read the Ophthalmic Assistant. The whole thing! I started with my weaker areas then just kept reading, a chapter or two a night, or whatever I could manage for the time I could allot. I think I finished the book in two weeks. That left the third week to look over the stack of handouts that I received when I had taken a COT review course. Check your local area to see if they offer this. This is a good foundation for studying and you can ask questions of your peers, or perhaps find people to study with if that helps you. During this week I also did the COT flashcards. These weren’t as easy as the COT Exam Manual because they were just fill ins instead of multiple choice so it really worked your knowledge. But they asked other questions that were not in Exam Manual. The final week leading up to the exam I went through the questions of the COT Exam Manual again. Same deal. No open book. No cheating. But this time instead of writing down each question I just made an Excel spreadsheet of numbers for each chapter and put in my lettered answers. And wouldn’t you know my grades went up! Optics 91%; Basic Ocular 91%; Visual Fields 76%. Unfortunately I didn’t have enough time to do the rest, but if I had given myself more time, like two months instead of the month that I had, I would have been even more prepared. What I did do was go over the questions I got wrong and read the answers so that I understood them. The answers in the back explain the concept of the questions, the answer, and why the others could not have been right. Very thorough. Cut your studying into manageable chunks. I understand that life gets in the way and studying gets put to the wayside. You know yourself better than anyone else. If you’re a fast reader or you’re pretty confident in your basic ophthalmic knowledge perhaps you don’t need as much time to prepare as one who is not as fast or who needs more time to process the information (some of it is dry and mind-numbing). I walked around like an ophthalmic zombie for that month. And let’s not get into the crazy dreams I was having while my brain found some way to upload all the information I was trying to stuff into it! So if you’re a vivid dreamer, like myself, be prepared for a good show when you close those eyelids! Give yourself breaks too. Don’t try to plow through the information just to get it over with for the night, you won’t retain any of it. If I got to that point where I was reading but not really paying attention I stopped and set my phone timer for a half hour or 45 minutes and did something else (make food, take a nap, watch an episode of Cake Boss….anything other than eye stuff). Then I’d be back with a little more focus. A good tip for timing your studying if you’re allotting more than 2 hours is study for 45, break for 20, study for 45, break for 20, etc. Set a timer while you’re studying that way you’re not constantly looking at the clock wondering if the torture is over yet. Study the best way that fits you. If you’re visual, write it down or draw it out; prefer audio, read out loud. Get all your senses going. Also slooooooow down and read EACH question carefully. In the Exam Manual there was a question that said “The blind spot in the visual field is…” and the choices were: Macula; Pupil; Cones; Optic Nerve. I was not paying attention or thinking for that matter so I put Macula! DUH. What a dummy I was. Studying for a test will do that to you. So be aware of that and read each question twice or three times before you answer. My adviser suggested I shoot to pass with an 80%. That’s a lot of information to digest and it doesn’t give you a lot of wiggle room to get things wrong. There are 210 questions on the test. 10 do not count for real points, but you don’t know which ones they are, so that leaves you 40 questions approximately that you can get wrong. In the scheme of things that is not a lot. The computer can be pretty daunting. But like I said before, take your time. You have an average of one minute per question. Read each question carefully before you answer. Don’t rush through it. Write down any tips, diagrams (that was muscles for me) or formulas that you got hung up on on the paper provided so you have it to look at. My tip #1: With muscles abduct and adduct always got me confused. Then I saw that if the ‘a’ is the “nose” than ‘ab’ means the muscle goes out towards the ear. The ‘b’ is facing away from the ‘a’. With adduct, going towards the nose, the ‘d’ is facing the ‘a’. This only works in lower case letters! 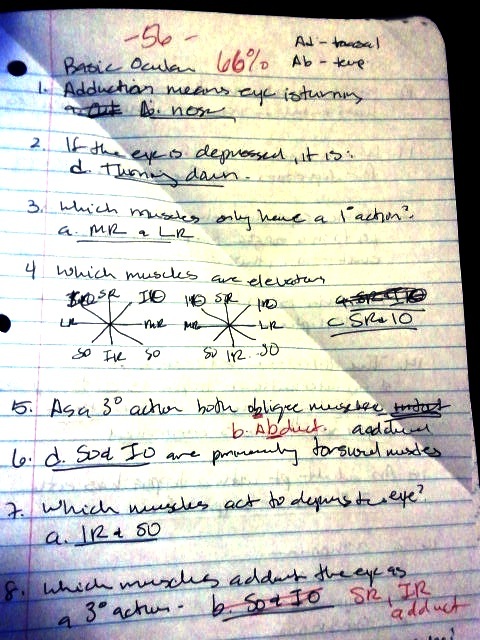 Tip #2: oBlique muscles tertiary action is aBduction. B for B. Superior and inferior rectus muscles tertiary action is adduction. First pass through the exam I answered all the questions that I was 95% to 100% sure of and marked any question I wasn’t sure of. Second pass I went through all the Marked Questions slowly. Reading them. Thinking about them logically. Marked them again if I still wasn’t sure. Be aware of your time. Just don’t freak out. Third pass I went over the final Marked questions. If I still didn’t know the answer again I just had to guess. Better to guess wrong, than get it wrong because it was left blank. Who knows you might have gotten it right. If you have time for a fourth pass, go through the entire exam again. Read the questions. Make sure the answer is what you wanted. I made it to the very last seconds. The you have to sit and wait a harrowing 30 second before the unofficial results are given to you. Averaging my scores I managed an 87%. Yay! AFTER THE EXAM: Be ready to download all the information. I went through a complete brain drain that day, at one point I couldn’t even find my keys! LOL Call your family and your friends, do a dance and be happy about your achievement! Please let me know if this helped you pass your exam! 04/02/2012 Update: It took 3.5 weeks to receive my letter after I took the skills exam. It’s official, I’m a COT! 2013 Exam Fees for all levels. Certified Ophthalmic Assistant (COA) and Certified Ophthalmic Technician (COT) tutoring available. I am offering my tutoring services if you need help studying for your exam. Fee is $30 for 60 minutes of prepaid time through Paypal then we can Skype or Phone. If you are in the Massachusetts area one-on-one or small session group tutoring is available, fee will vary depending on distance, group size, and time. Please contact me, Eenae (pronounced like eBay, but with an ‘n’) Eye (yes, that is my last name), at eyetutoring@gmail.com for more information. Thank you for the advice. I am taking my test next week and am a nervous wreck. Will let you know how i do. for the medial and lateral rectus i just remembered “Mad Lab” Medial ADducts, Lateral ABducts. Passed my COT written test a few months ago, and just passed my Skills Attempt this month on the first try. The practice disc was without a doubt, a huge help! I’m glad my job paid for it, since it was $300, eek! Congratulations! Love the MAD LAB! Great Tip! Where can you get the practice disc? It comes in the study package after you pass the COT written exam. First, I would want to congratulate you on your success in the exam. I have a licencing Exam scheduled for next week. I came across your post in an attempt to gather review questions. However, I have als checked out the manual you used during your preparation but realised it’s not feasible to get the hard copy before my exam. Please Ma, can you help me with the soft copy of the manual or any other review questions I could revise before next week. Thank you. Thanks for posting this information, which is very helpful. Congrats on your success. Just an FYI to your readers, http://www.eyetec.net has a COT exam prep course as well as prep courses for COA and COMT. The COT prep course has already been updated for the new material when JCAHPO converts to the new COT exam in 2013. How can I find a price on the exams? Do you have to register with them to get an idea of the cost? Hello there, I am about to take the test, three weeks from today to be exact. I have been in an actual school program to become a COT and have been reading the COT and COA study guide books for about a month now with the flash cards for additive. Did you also do a formal training program or were you on the job trained?? I am always curious on people that pass if they had school to help or worked on the job and that helped them pass. Hi Katie, I was in optometry school for about a year and a half, I was unable to complete the program but got hired at the New England Eye Center in Boston and increased my basic technician skills there whilst studying for my COA. About two years later, I was hired by my current job, Dedham Ophthalmic Consultants and Surgeons, and there I was trained to learn the more advanced equipment: HRT, OCT, ascan, fundus photography. I also got trained to assist in minor office procedures. I will tell you this that even if you’ve had formal classes or trained on the job or studied most books, there are going to be a few questions on the exam that you’re going to be like WHAT???? I don’t recall reading/learning/training about that at all. Just do the best you can. Answer all the questions you 100% know first. Good luck!!! Please let me know how you do! I passed btw! its a little late coming but I did. wanted to know what school program did you attend ive been looking for one but havent been able to find one please help! Hi Tina, Unfortunately, study for everything. All of the tests are different. Schiotz Tonometer was something I did not study as much on, nor really use on a day by day basis, and seemed to come up quite a few times. I went to a program at Portland community college, if you google them you can search for the Ophthalmic tech program and find out all about it. I loved my program, and am so GLAD that I did it that way!